Kareltjie is my main boy… he is a Dachshund with the heart of a lion. He is without a doubt the most sweet-natured, gentle-hearted, brave dog I have known. He is just pure love and cuddles. I was devastated when in February 2015 my boy hurt his back while running outside. He was completely paralysed from behind his front shoulder blades. When the vet examined him, there was absolutely no reflex or reaction when he stuck a needle along Kareltjie’s spine to check nerve impulse. We were advised that we should consider putting him down, but we decided against it. We resolved to nurse him back to health. Paralysis is a common problem with Dachshunds, and previously our female, Clara, also went lame in her back legs. Three months of love and care saw her recover. We knew that he would get better – we never expected that 14 months later he would still not have made a full recovery. Putting him down was not an option without first doing what we could to help him get better. I could not bear the thought of giving up without at least trying to get him better. For the first few months after his injury, there was no improvement. He had lost complete control of his bladder and bowel movements. We used nappies, which we would cut into shape and slide in under him. We would also take him outside and try help him go to the toilet by holding him up. I was with him pretty much 24 hours a day, getting up at night, sometimes up to 15 times, to help him. I would give him long massages along his spine, which he loved. We were thrilled, when after a few months, his muscles started twitching while I was massaging him. He started pulling himself around, his back legs completely lame, dragging behind him. Then he started balancing on his back legs, and eventually started “walking” , though he did not have much control over the movement of his legs. The back part of his body would stagger behind him like a drunk. Although he has been able to walk on his back legs, he could not lift them properly and his toes would drag a little as he walked. He could also not scratch himself. When he is itchy, we help him. He has a way of gently biting your fingers and pulling them where the itch is, or grabbing your hand under his snout and pulling it to where he wants you to scratch. He learnt how to gallop, which allowed him to run with the pack. He loves to run and play with the other dogs. Despite being lame, he was such a happy, lively, lovely dog. Even when he could not move much, he loved to love and cuddle. There were times when he reacted to medication which we gave him to alleviate the inflammation, which left him very sick with kidney problems – but he thankfully recovered after a few days. These were the only times that he was really not well, and we would discuss the fact that perhaps it was time that we relieved him of the struggle. With many tears cried, by the time morning came he was recovered and full of the joys of life again – and so, we too, kept going. Unfortunately, this meant the healing was slowed down, because we could not give him any medication. So, we stuck to massaging and love and helping him where we could. For a number of months, there had been no change in his condition, and I often wondered if he would ever gain full use of his legs again. That was until a few weeks ago, when he got a bad infection in the pad of his front paw and could not walk on it – leaving him with just one working leg. 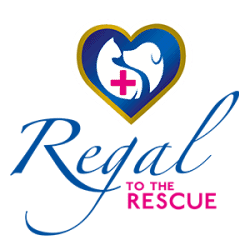 I went to Central Vet in Middelburg where I saw the Regal Pet Health range. 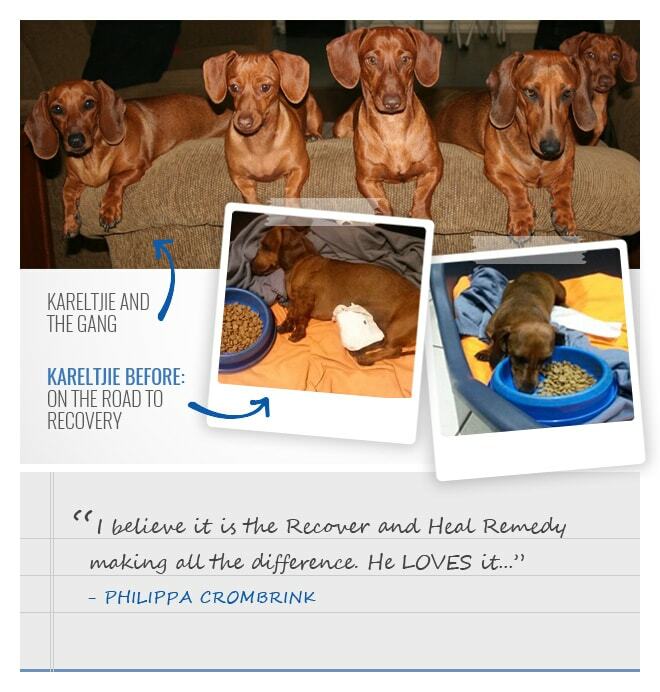 I bought the Skin Care Remedy, the Skin Healing Spray as well as the Recover and Heal Remedy, which I started giving to Kareltjie as well as my other 4 dogs. They all had seasonal skin allergies, and have responded really well to the skin treatment. Kareltie’s paw recovered very quickly –and to my delight – the use of his legs has improved dramatically! He has been able to stand and lift his leg – which is a big deal for a big and brave male dog. He has better control of his bladder and bowel movements. His walk is stronger and he no longer looks like he is drunk when he walks. He is able to climb into his basket, lifting and using all four legs, instead of dragging the back half of his body into the basket. I am absolutely astounded at the improvement. He has started standing up on his back legs, without them collapsing under him – to the point that he has started hopping on his back legs when he wants me to pick him up. I can feel a significant improvement in the strength of his back legs. And he is happier than ever. I believe it is the Recover and Heal Remedy which is making all the difference. He LOVES it and comes asking me for his medicine every morning and night. He is certainly much more playful and happy since taking your product. He loves to make us laugh, and without a doubt is being a real clown lately. More than normal, he is bringing toys for us and teasing us so that we can chase him. He is an avid soccer player and I will be glad to let him chase his ball around the garden soon without worrying that he his going to have a setback.